Erasing all uncertainty about his political intentions, Das Williams told The Independent early Wednesday that he will definitely run for the 35th Assembly District seat. The decision by the Santa Barbara city councilmember ends months of speculation and sets up a lively Democratic primary battle between two former allies: Williams and environmental attorney Susan Jordan, wife of Pedro Nava, the district’s outgoing incumbent. Williams said he would make a formal announcement of his candidacy “within the next couple of weeks” and expected to have an impressive list of endorsements at that time. He said that while he has been eyeing a run for the Legislature for several years, he hesitated to jump into this campaign because of his past alliances with Jordan and Nava working on environmental issues. Shortly before Jordan announced her candidacy last year, Williams said he met with her and Nava and was very surprised to hear that she was running. 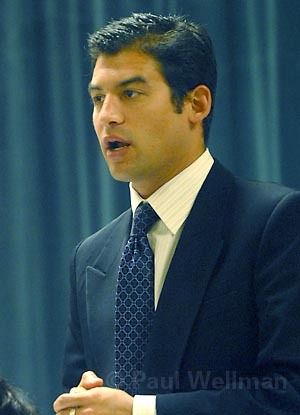 At that time, Williams spoke glowingly of Jordan in an interview with The Independent‘s Nick Welsh, who reported that Williams “all but endorsed” Jordan for what Williams said then was “the greater community.” One reason for his statement at the time, Williams said Wednesday, was that he was working hard on Hannah-Beth Jackson’s Democratic bid for a State Senate seat and didn’t want “to split progressives” in the middle of that campaign. Williams said that a decisive event in his final decision to run was the action taken by Jordan and Nava in helping to sink a painstakingly negotiated agreement between major environmental groups and Plains Exploration and Production (PXP) oil company. With most local environmentalists and many elected officials lined up behind the agreement, Nava and Jordan angered many in the progressive community by strongly opposing the plan, which was voted down by the State Lands Commission in January. The deal would have expanded PXP drilling rights at the Tranquillon Ridge Field offshore from Vandenberg Air Force Base, in exchange of a mandatory shutdown date of 2022, thousands of acres of permanently protected onshore lands, approximately $350 million of tax revenue for Santa Barbara County, and at least $2 billion for the state. Exactly who will be endorsing Williams when he has his official announcement later this month is unclear. But he can certainly count on the county’s 1st District Supervisor Salud Carbajal, who’s been publicly supporting a run by Williams for months now. Stay tuned for one of Santa Barbara County’s biggest Democratic Party showdowns in recent memory.